Beal, B.F., Coffin, C.R., Randall, S.F., Goodenow, C.A. Jr, Pepperman, K.E, Ellis, B.W., Jourdet, C.B., and Protopopescu, G.C. 2018. Spatial Variability in Recruitment of an Infaunal Bivalve: Experimental Effects of Predator Exclusion on the Softshell Clam (Mya arenaria L.) along Three Tidal Estuaries in Southern Maine, USA. Journal of Shellfish Research, 37 (1), 1-27. The infaunal, suspension-feeding softshell clam (Mya arenaria L.) is a conspicuous member of the intertidal macrofauna in numerous northern temperate and boreal soft-bottom communities. Recruitment variability can affect the magnitude and scope of various ecosystem services provided by M. arenaria, including its role as a source of food and energy for organisms at higher trophic levels. Manipulative field experiments were conducted in the intertidal zone in 2014 and 2015 at three tidal estuaries in southern Maine, to investigate the importance of post-settlement processes in determining the strength of the annual 0-y class cohort across predator-exclusion treatments within and between tidal heights. Four short-term (4–5 mo), small- scale studies over both years in the Webhannet River (Wells, ME) and Fore River (Portland, ME), the two southernmost estuaries, demonstrated that clam recruits were up to 1183 more abundant when predators were deterred versus controls. In a 7-mo study conducted in the Harraseeket River (HR; Freeport, ME) during 2014, recruits of Mya attained densities 8993 greater in large-scale plots designed to exclude large (>6 mm) predators than in ambient, adjacent sediments where predators were undeterred. A novel, epibenthic settlement trap (0.15 m2), initially containing no sediments and designed to deter both infaunal and epibenthic predators larger than 1.9 mm, was used to examine spatial variability in clam recruitment over a 6-mo period in 2015 in the HR. Traps showed a 60-fold difference in mean number of clam recruits between sides of the river only 600 m apart. Collectively, results suggest that post-settlement mortality rates of 0-y class individuals of Mya exceed 99% at these locations, severely limiting ecosystem services they would otherwise provide, and that these early losses are primarily responsible for explaining distribution and abundance patterns of $1-y class individuals. McGreavey, B.; Randall, S.; Quiring, T.; Hathaway, C.; Hillyer, G.
2018. Enhancing Adaptive Capacities in Coastal Communities through Engaged Communication Research: Insights from a statewide study of shellfish co-management. Ocean & Coastal Management 163, 240-253. Intertidal ecosystems and the small-scale fisheries these ecosystems support are an important part of coastal economies, environments, and cultures. Globally, fisheries such as the soft-shell clam face multiple stressors related to climate change, invasive species, and unsustainable land use. Co-management approaches based on shared responsibility for resource management among other actors and institutions can build resilience to socio-environmntal change by strengthening the use of science in decision making and promoting adaptive capcities such as learning and leadership. In this paper, we demonstrate how engaged communication researc can help foster adaptive capacities to enhance the resilience of these systems. We describe how specific communication factors influence adaptive capacities such as learning, leadership and equity. We conclude with recommendations and demonstrated evidence of the value of bringing engaged communication research to bear on pressive issues of climate change. Tan, E. B. P.; Beal, B.F.
2015. Interactions between the invasive European green crab, Carcinus maenas (L.), and juveniles of the soft-shell clam, Mya arenaria L., in eastern Maine, USA. Journal of Experimental Marine Biology and Ecology 462, 62–73. Invasive species pose a threat to biodiversity in numerous marine ecosystems, and may have severe economic effects on commercially important species. The European green crab, Carcinus maenas, is one of the most common invaders of marine ecosystems globally. Since its invasion into eastern Maine, USA, during the early 1950’s, populations of the soft-shell clam, Mya arenaria, have declined greatly. This has triggered the establishment of shellfish hatcheries and the development of aquaculture techniques to enhance the wild fishery. This study investigated interactions between C. maenas and cultured juveniles of M. arenaria both in the field and lab- oratory. In the field (Holmes Bay, Cutler, Maine), clam (initial mean shell length [SL] ±95% CI: 15.8 ± 0.5 mm; n= 30) survival was: 1) 7 × higher in predator deterrent treatments compared to open controls; 2) not improved by using rigid vs. flexible netting; and, 3) not improved by raising and supporting deterrent netting 5 cm above the sediment surface. Wild clam recruitment was 4x greater in protected vs. open experimental units. In laboratory trials using similar sized juvenile clams, green crabs consumed clams protected by predator deterrent netting, and in one case did so without leaving visible signs of chipping, crushing, or disarticulating the valves. Physical evidence, other than crushing, may be used to differentiate between clam death due to predation vs. suffocation, disease, or other sources of mortality. 2006. Relative importance of predation and intraspecific competition in regulating growth and survival of juveniles of the soft-shell clam, Mya arenaria L., at several spatial scales. Journal of Experimental Marine Biology and Ecology 336, 1-17. Predation appears to be the single most important biotic factor regulating populations of bivalves in estuarine and coastal soft sediments. However, the relative roles of predation and intraspecific competition are rarely investigated simultaneously over different spatial scales, making generalities about these mechanisms difficult. Using juveniles of the soft-shell clam, Mya arenaria (initial mean shell length [SL] ± 95% CI = 12.4 ± 0.13 mm), I tested the interactive effects of predator deterrence and intraspecific density (660 vs. 1320 individuals m− 2) on growth and survival responses over a 185-day period from May to November 2003 at spatial scales that spanned four orders of magnitude: embayments, sites within embayments, tidal gradients, and blocks that were 10,000’s, 1000’s, 100’s, and 5 m apart, respectively. 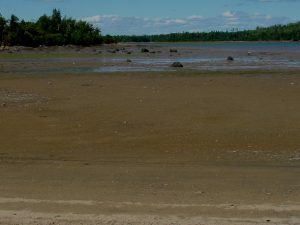 Replicate field experiments were conducted from May to November 2003 at the upper and lower tidal heights at each of two intertidal mud flats (sites) within each of two embayments (Passamaquoddy Bay [PB] and Cobscook Bay [CB]) in eastern Maine. Mean survival, relative growth, and the abundance of wild recruits each varied significantly over all spatial scales. Predation was the most important factor affecting clam survival, explaining 45% of the total variability, whereas embayment, sites within embayments, tidal gradient, and intraspecific density collectively accounted for less than 10% of the variation. At all four intertidal sites, clam survival in experimental units designed to deter predators averaged 72%, but the degree of enhancement varied between embayments (PB = 61%; CB = 267%). Average survival rate was higher (by 12–16%), but growth was slower (by ca. 50%) in upper vs. lower intertidal blocks; however, the patterns differed for both variables between sites within each embayment. The effect of increasing intraspecific clam density was to lower survival by ca. 17% (56% [660 m− 2] vs. 48% [1320 m− 2]) in both embayments, but growth was unaffected. Overall, clams doubled in SL, although mean relative growth was 15% greater in CB than PB. Tidal gradient, sites within embayments, and blocks were the three most important factors explaining 35%, 19%, and 22% of total variation in relative clam growth, respectively. In Maine and the northeast US, juveniles of Mya reach their highest abundance above mean low tide levels. Experimental evidence presented here suggests that differential predation along the tidal gradient is the dominant factor controlling clam abundance and distribution patterns in the intertidal zone. Collecting samples from Half Moon Cove – West (Cobscook Bay) on November 21, 2003. 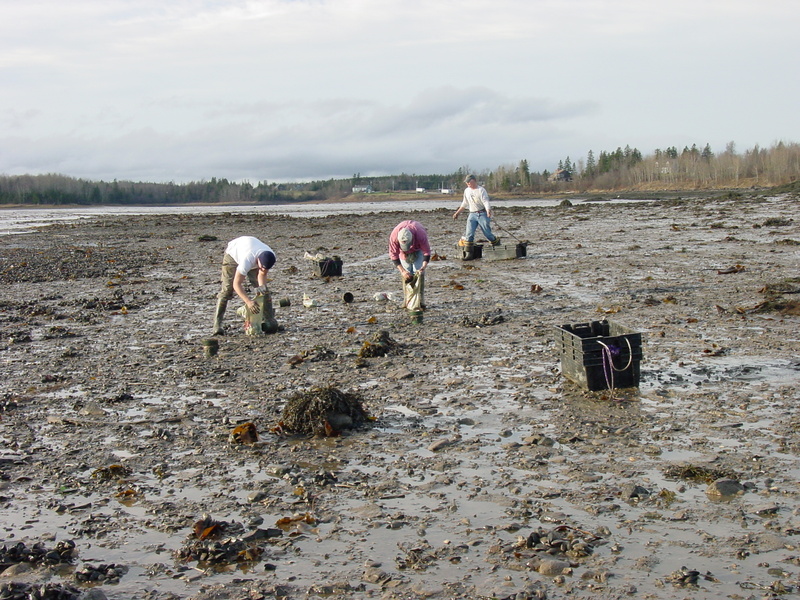 Pulling the six-inch plant pots from the intertidal flats on November 21, 2003. An open enclosure with a tag indicating that the sample was taken from the low-water mark at Half Moon Cove – West (Cobscook Bay), and that it initially was seeded with 24 cultured soft-shell clam juveniles, and that the experimental unit was in the first block. Processing the samples (washing the samples through sieves) at the University of Maine at Machias. Hatchery-reared soft-shell clams with a “hatchery mark” that allows one to measure the initial size and the final size to obtain a growth rate on an individual that one did not have to mark uniquely. 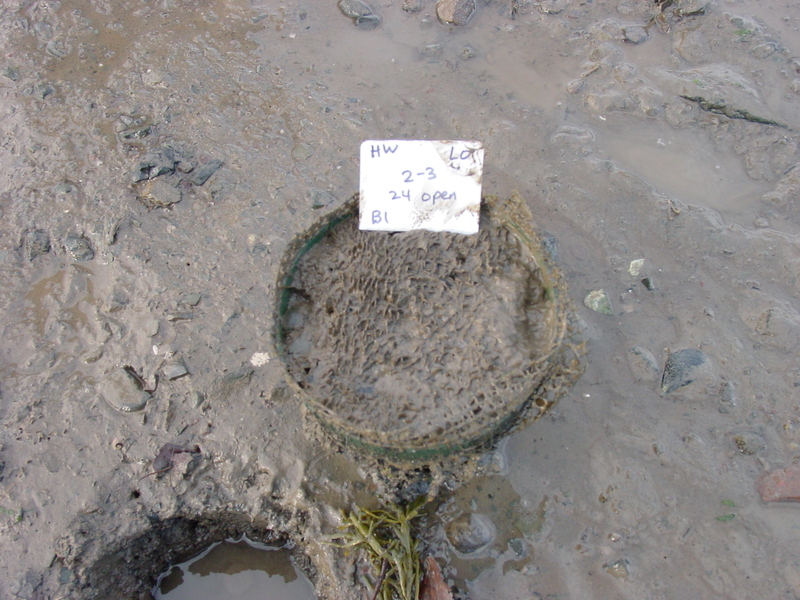 The tag for this sample indicates that in May 2003, the clam juveniles were planted in the lower intertidal at Gleason Cove (Passamaquoddy Bay) at a density of 12/6-inch plant pot (experimental unit) that was protected with plastic mesh netting. The unit was in position 2-2 in the first of five blocks at that tidal height. 2006. Biotic and abiotic factors influencing growth and survival of wild and cultured individuals of the soft-shell clam (Mya arenaria L.) in eastern Maine. Journal of Shellfish Research 25, 461-474. Predation by moonsnails on juvenile, cultured soft-shell clams. Experiment was performed in Lubec (Haul-Up) in 2009. 2002. Adding value to live, commercial size soft-shell clams (Mya arenaria L.) in Maine, USA: results from repeated, small-scale, field impoundment trials. Aquaculture 210, 119-135. The soft-shell clam (Mya arenaria L.) fishery in the state of Maine, USA, is worth $5-10 million annually and is primarily based on the sale of live individuals. More than 80% of the catch is sold for the “steamer clam” market that is highly seasonal due to supply and demand. Prices paid to harvesters for live clams throughout the year increases by as much as 70% during a 4-month period between early spring and late summer. If clams harvested in the spring could be held until late summer, a value-added product could be developed in this fishery. From April to August 1996, at an intertidal and subtidal location in eastern Maine, I tested whether it was biologically feasible to impound commercially harvested clams (shell LENGTH=44-75 mm) at densities between 720 and 850/m2 using cages and nets (1.12 m2) to protect animals from predators. A “clam pound.” Constructed of vinyl-coated lobster trap wire, this pound contains one-bushel of commercial size soft-shell clams (> 50 mm SL). Survival from April to August 1996 was ca. 95%.predators. Survival was 91.7% (n=12) and 91.6% (n=6) at the intertidal and subtidal site, respectively. There was no discernible shell growth during this period and there was no difference between initial and final clam weights. The methodology was transferred to commercial harvesters in two Maine communities: Wiscasset (1997 and 1998) and Perry (2000). Impounded clams (x=21.8 kg/cage; n=18) lost, on average, 5 kg/cage in 1997 and 1998, whereas no significant net loss in wet weight occurred in cages deployed in 2000 (x=23.2 kg/cage; n=3). 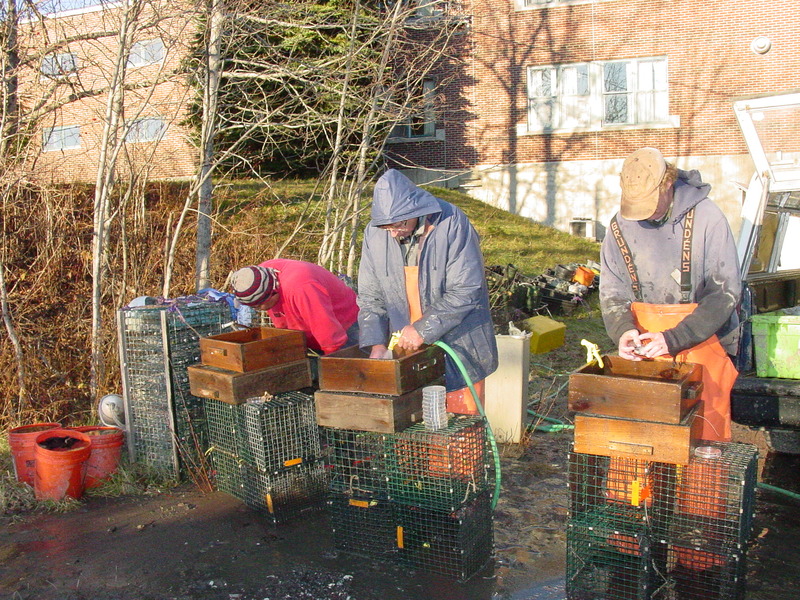 Differing harvesting and handling methods of individual clammers, prior to impounding clams, likely explains the variation in weight lost during the impounding periods. The difference in price per live kilogram between the beginning of the impounding period and the August sale date resulted in an average gain of $13.60/cage for clammers in 1997 and 1998 and $57.73/cage in 2000. Simple culture techniques can be used to increase the value of the live harvest of soft-shell clams along the coast of Maine. Clam impoundments may be a way for communities that co-manage the public clam resource with the state’s marine resource agency to generate funds to pay for traditional management schemes, as well as enhancement programs that employ hatchery-reared juveniles. In addition, an indirect benefit of clam impoundments might be to create spawner sanctuaries since animals are impounded during the time when gamete release occurs. 2002. Interactive effects of initial size, stocking density, and type of predator deterrent netting on survival and growth of cultured juveniles of the soft-shell clam, Mya arenaria L., in eastern Maine. Aquaculture 208, 81-111. Recent declines in commercial harvests of soft-shell clams, Mya arenaria L., in Maine, USA, have prompted state and local officials to consider enhancing wild stocks with hatchery-reared seed. We conducted two manipulative field experiments in the soft-bottom intertidal zone during 1990 and 1991 in eastern Maine to assess effects of predation, intraspecific competition, and initial planting size on the survival and growth of cultured individuals of Mya. Experiment I (23 June 1990 to 13 June 1991) tested interactive effects of two planting sizes (small=8.5 mm shell length (SL); LARGE=11.8 mm SL) and protective netting on fate and growth of clams. Animals of each size were added to separate experimental units within each of 60 1-m2 areas delimited by a wooden box. To deter predators, 50 boxes were covered with a specific type of plastic netting that differed in aperture size (4.2, 6.4 and 12.8 mm) and degree of rigidity (flexible vs. extruded) while 10 boxes served as controls (without netting). Small clams grew at a faster rate than large clams, but both added approximately 18 mm of new shell by the end of the study. Growth was unaffected by netting size and rigidity, but 13% more clams were recovered alive after a year in protected vs. unprotected treatments (84% vs. 71%). Survival was independent of netting type. The presence of netting resulted in nearly a 3x—enhancement of wild spat ( < 15 mm SL) compared to unprotected controls (568.8±24.4 vs. 199.6±22.8 m2). This result suggests that the decline of wild stocks in eastern Maine may not be related to recruitment failure, but to post-settlement events, such as predation, which remove clams from the intertidal. In Experiment II (15 April to 6 October 1991), clam (14.6±0.2 mm SL) density was manipulated across four levels from 333 to 2664 m2 in protected (extruded netting, 12.8 mm aperture) and unprotected 1-m2 boxes. Survival within unprotected boxes was independent of stocking density (79%), but was inversely density-dependent in protected boxes (77% in the lowest density treatment increasing to a mean of 88% in the other three treatments). A negative cubic relationship explained the effect of density on growth. 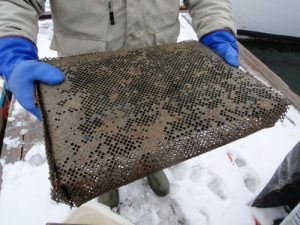 We present the first mariculture strategy for public stock enhancement or private entrepreneurs interested in rearing M. arenaria in Maine and the northeast US. 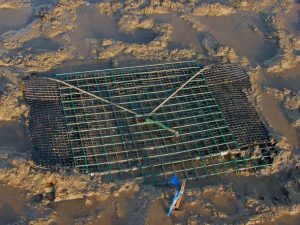 hatchery-reared juveniles 8-10 mm SL should be planted in the spring near or below mid tide levels at densities between 333 and 666 m2 and protected with flexible netting (6.4 mm aperture) raised several centimeters above the sediment surface. Netting should be removed from mud flats in the late fall before the threat of ice and severe winter storms. Animals should attain sizes between 25 and 30 mm SL during this time and reach a size refuge from burrowing and other predators. Growth to legal, commercial size (50.8 mm SL) should take another 2-4 years depending on geographic location and mean seawater temperature. Beal, B.F., Parker, M.R., Vencile, K.W. 2001. Seasonal effects of intraspecific density and predator exclusion along a shore-level gradient on survival and growth of juveniles of the soft-shell clam, Mya arenaria L., in Maine, USA. Journal of Experimental Marine Biology and Ecology 264, 133-169. The relative roles that predation and competition play in regulating populations of infaunal marine bivalves in soft-bottom systems are strikingly different. Exploitative competition for food typically occurs at elevated densities, but crowding rarely results in mortality and competitive exclusion. Predation by decapods, gastropods, and, sometimes asteroids, is more important in controlling patterns of distribution and abundance. Most field tests leading to this synthesis have been conducted between 35°N and 35°S and/or with bivalves in the families Veneridae and Tellinidae. To test the robustness of these ecological processes at another geographic setting (45°N) using a species from another family within the suspension-feeding guild (Myidae), we performed a short-term field manipulation at an intertidal mud flat in eastern Maine. Flake Point Bar (Jonesport, Maine) where the field experiment (April – December) 1996 was performed. We followed survival and growth of 10,080 juveniles (12.4-mm shell length (SL)) of the soft-shell clam, Mya arenaria L., in field enclosures with and without predator-deterrent netting at three densities (330, 660 and 1320 m-2) along a tidal gradient over four sampling intervals from April to December 1996. We used a generalized completely randomized block design to assess variation in these dependent variables within a given tidal height (high, mid, and low) on a particular date. Mortality varied seasonally, peaking (13.6%) between August and September when seawater temperatures were warmest. No significant mortality occurred after September, when mean (±95% CI) percent survival pooled over all treatments was 72.9±8.5%. Netting (6.4-mm aperture) effectively excluded predators along the tidal gradient as overall mean clam survival, independent of tidal position, was 88.7±4.1% in protected units (plastic plant pots with AREA=181 cm2), but decreased from upper and mid tide levels (82.9±6.1%) to lower on the shore (66.3±9.7%) in unprotected units. Density-dependent mortality resulted in reduced survival (by 4.6%) in clams stocked at the two highest levels however, numbers of dead clams with undamaged valves provided little evidence that this effect was due to starvation. Incremental growth also varied seasonally with greatest amounts of shell added during June-August at all tidal levels. Shell growth stopped or slowed significantly after September at all tidal positions. Mean SL increased with decreasing tidal height (December sizes: HIGH=20.6±2.9 mm, MID=24.1±1.0 mm; LOW=28.2±1.2 mm); however, submergence time alone failed to explain completely these differences. Density-dependent growth was detected once (August-September). Animals at the two highest densities experienced a growth depression of ca. 7%. We conclude predation, rather than competition, is more important in regulating populations of soft-shell clams in this intertidal location. 2001. Short-term effects of commercial clam (Mya arenaria L.) and worm (Glycera dibranchiataEhlers) harvesting on survival and growth of juveniles of the soft-shell clam. Journal of Shellfish Research 20(1), 1145-1157. In Maine, USA, commercial fisheries for soft-shell clams, Mya arenaria L., and blood worms, Glycera dibranchiata Ehlers, occur simultaneously on muddy intertidal flats. Local and state clam managers frequently close flats to shellfishing for conservation purposes, but have no jurisdiction over wormers who are legally permitted to harvest G. dibranchiata on any intertidal flat. This sometimes causes conflicts, especially when wormers dig in clam conservation areas where clammers have enhanced stocks with wild or cultured “seed” clams (<1 cm shell length, SL). Clammers believe wormers kill or injure small clams directly or indirectly while commercially harvesting G. dibranchiata. To help resolve these long-standing conflicts, we worked collaboratively with clammers and wormers and used an experimental approach to test the short-term interactive effects of clam and worm harvesting, harvesting intensity, time of harvest after seeding, and predator exclusion on the fate of small wild and cultured M. arenaria at an intertidal mud flat in Brunswick, ME. We added 50 cultured juveniles of M. arenaria (SL = 12.5 mm) to 120 1-m2 plots, 40 of which were undisturbed controls (20 protected with plastic netting–6.4 mm aperture; 20 unprotected) from May to August 1996. The remaining 80 plots were assigned to one of 16 treatments. One half of the plots were protected from predators with the same plastic netting used in the undisturbed control plots. One half of the plots were harvested by a professional wormer or clammer who searched each plot for commercial size blood worms and soft-shell clams, respectively. Plots were harvested either once (after two weeks or four weeks) or twice (two weeks + two weeks, or four weeks + four weeks). 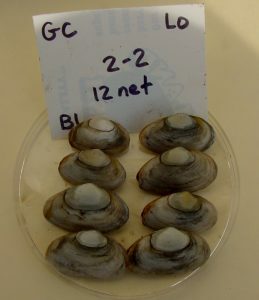 Any effect due to clamming or worming on cultured clams or wild individuals of similar size was masked by clam losses exceeding 95% in the unprotected control plots. Intense predation by horseshoe crabs, Limulus polyphemus L. and the nemertean worm, Cerebratulus lacteus Leidy, are blamed for the high mortalities among clams. Only in protected plots was any effect detected and this depended on clam origin. Compared to the fate of cultured clams in protected controls, worming had no effect, but clamming contributed an additional 15% loss. Both types of commercial harvesting reduced wild clam numbers significantly compared to controls, but effects due to worming were more benign than effects due to clamming probably because wormers excavate less volume of sediments than clammers do as commercial size G. dibranchiata are shallow burrowers compared to commercial size M. arenaria. Unless clam managers actively take steps to deter predators by using netting or other means, blood wormers should continue to harvest commercially from areas closed to shellfishing without reprisal or fear that they are causing damage to populations of juvenile soft-shell clams. The study showed that clamming can have a negative effect on the survival of clam spat. Beal, B.F., Bayer, R., Kraus, M.G., Chapman, S.R. 1999. A unique shell marker in juvenile, hatchery-reared individuals of the softshell clam, Mya arenaria L., Fishery Bulletin 97(2), 380-386. Another example of the “hatchery mark.” Most individuals were 12-15 mm when planted on 1 November 1988. Soft-shell clam juveniles reared under hatchery conditions at the Beals Island Regional Shellfish Hatchery and the Downeast Institute for Applied Marine Research & Education for a unique disturbance line on the shell at the size when placed into the field under any sedimentary conditions. This marker is called the “hatchery mark,” and it enables investigators to place juvenile M. arenaria in the field without marking individuals uniquely. After some time in the field after which shell growth is apparent, one can easily measure the size of the clam at the time when it was transplanted and then measure the final shell length. The difference between final and initial shell length (SL) is the absolute growth of the clam during the period it was in the field. 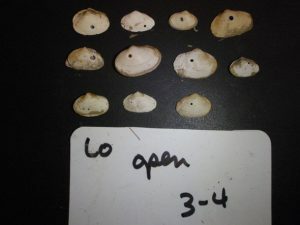 The photos below show that the “hatchery mark” forms on clams as small as 6 mm to as large as 12-15 mm SL. Disturbance line (hatchery mark). Clam was planted on 4 May 1989 at Duck Brook Flat (Cutler, Maine) and grew to size shown by 6 August 1989. Beal, B.F., Lithgow, C.D., Shaw, D.P., Renshaw, S., Ouellette, D.
1995. 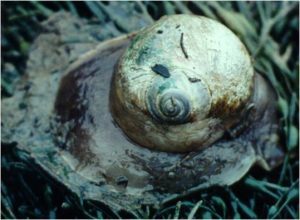 Overwintering hatchery-reared individuals of the soft-shell clam, Mya arenaria L.: a field test of site, clam size, and intraspecific density. Aquaculture 130, 145-158. Soft-shell clams (Mya arenaria L.) are a commercially important intertidal bivalve in Maine, USA where they are managed as a common property resource. Ten million 8-12 mm clam juveniles are reared annually at the Beals Island Regional Shellfish Hatchery and are transplanted onto publicly-owned mudflats during the fall or early winter. The success of this strategy is unpredictable because of sporadic occurrence of winter ice formation and subsequent scouring of the intertidal zone. These events, in addition to other severe winter storms, can result in complete mortality of the transplanted seed. 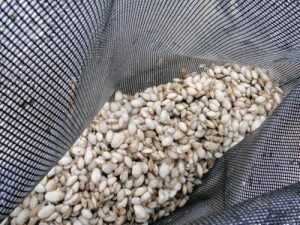 Transplanting hatchery-reared seed in the spring, therefore, is preferable, but until now there has been no economically effective technique to hold millions of soft-shell clam seed over the winter. A field experiment designed to test the interactive effect of clam size and density on survival was conducted during the winter of 1991-1992 at a sheltered and exposed site near Beals, Maine, USA. 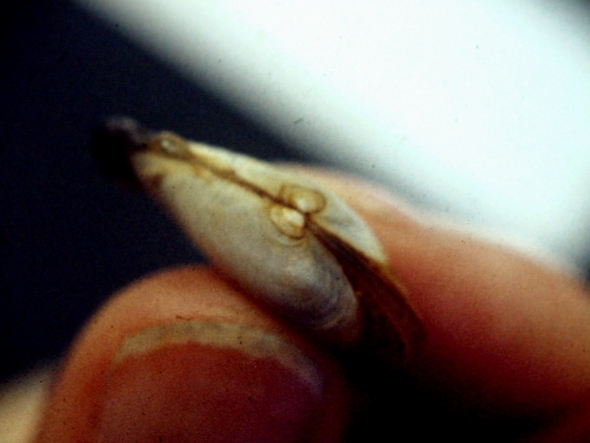 Three sizes of hatchery-reared clam seed (Small, shell length [SL]; Medium, 8.2 mm SL; Large, 11.5 mm SL) were used. Clam density was approximate and depended on clam size (Small, 18 750 ind, 37 500 ind, and 56 250 ind; Medium, 11 000 ind and 22 000 ind; Large, 4500 ind and 9000 ind). Clams of each size/density combination were added separately to nylon window screen, zippered bags (aperture = 1.8 mm). Bags containing clams were housed in wooden-framed subunits (0.45 m x 0.45 m x 0.08 m) covered with a 12 mm extruded mesh netting. Subunits were arranged vertically in groups of 4-6 and were submerged 1m above the bottom in shallow water (3-8 m) from November 1991 to April 1992. Mean survival of medium and large size clams at both sites was 97.7%. Significant density effects were detected for both size groups at the sheltered site, although the difference between treatment levels was less than 2%. Mean survival of small clams pooled across sites was 67.8%. At the sheltered site, clams in the uppermost level of the overwintering units had consistently lower survival rates than those nearer the bottom. Density effects for small clams were detected only at the sheltered site where animals held at the highest density had significantly higher survival rates than animals at either of the two lower densities (75.3% vs. 60.3%). Clam loss over the winter may be reduced by suspending seed in seawater instead of transplanting it to intertidal flats. Filling overwintering bag with cultured soft-shell clams (Winter 2002). 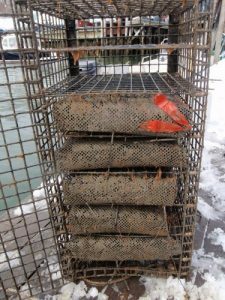 Overwintering cage constructed of vinyl lobster trap wire with two bags of cultured clams. Each bag contains approximately 25,000 clams (ca. 10 mm SL).